I’m a big fan of Easter Brunch gatherings. I love seeing everyone in their colorful Spring attire, energetic and ready to feast and celebrate the holiday. My Mini Frittatas will make a brilliant addition to your holiday menu. They are baked in muffin tins making them a perfectly sized individualized portion for your guests. They also display beautifully and are hard to resist since they are so adorably cute. Did I mention that you can make them the night before and re-heat them? They taste just as good, I promise! I’ve made a number of different recipe variations of these frittatas in the past. Being that it is a special occasion I made this recipe with sausage to make all of the men in my family happy. Chopped ham or prosciutto are equally delicious and don’t require any cooking before adding to the egg base. I used Orzo pasta to hold the frittatas together and give them a filling texture. Linguine pasta noodles also work great (just make sure to cut them into smaller pieces) and for kids, elbow pasta noodles are fun to use. See my Macaroni and Cheese Egg Muffins for Kids Recipe. The beauty of this recipe is you can be creative or simply use what you have on hand. My recommendation is to use good quality ingredients and to add a specialty item with a strong or distinct flavor for a wow factor. Sausage, red pepper flakes and smoked mozzarella cheese give these frittatas a slightly spicy and smoky kick. Specialty cheeses, nutty spices and flavored pastas will do the same. Before you run to the store to grab your ingredients, keep in mind that house made sausage at your local market will make a world of difference. If you make your own sausage at home you are my new idol! 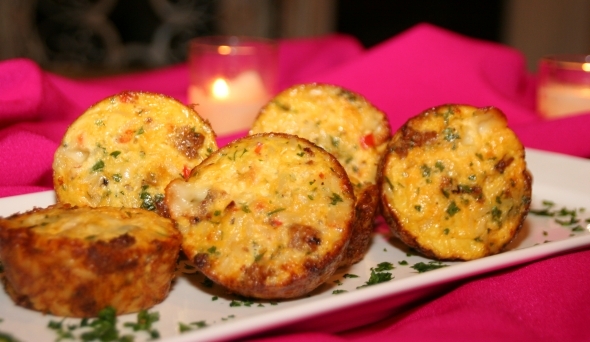 Mini Frittatas make a fun presentation and are perfect for individualized servings. This version will make a hearty addition to your brunch spreads! Preheat oven to 375 degrees with rack in the center. Spray Muffin tins with non-stick cooking spray. Set aside. Heat a large pan over medium-high heat. Add sausage and sauté, breaking apart into small pieces until cooked thru, about 5-7 minutes. Transfer to a medium bowl with a slotted spoon. Add bell pepper and sauté until just tender, about 2-3 minutes (add a small amount of oil if needed) add garlic and red pepper flakes and sauté 2 minutes longer. Transfer with a slotted spoon to bowl with sausage. Drain any excess oil. In a large mixing bowl, whisk eggs, milk, cream, salt and black pepper until blended. Add drained sausage mixture, 3 cups cooked orzo, cheese, parsley and stir. Using a half-cup measurement fill each of the muffin tins almost to the top (make sure solids are sunken into liquid). Bake until firm and cooked through, about 20 minutes. Immediately run a knife around the edges to prevent sticking and allow to slightly cool before removing from the pans. Arrange on a serving platter and garnish dish with additional parsley.